This is a fitness option that you can use as part of your fundraising campaign. It's a fun way to get everyone outside and exercising while raising funds for your organisation. 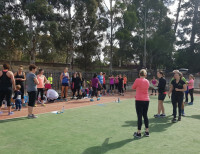 I am a qualified Personal Trainers who will run a bootcamp style workout as a fundraising event for your organisation. I make sure you not only have fun on the bootcamp but also to make sure everyone is exercising safely. So if you are in the eastern suburbs of Melbourne and are part of an organisation such as a kindergarten, childcare centre or sporting club that needs help raising funds, then I can help you! I provide an event that focuses on health and fitness while helping community organisations such as yours. I want to help take the stress out of organising an event so that all you have to do is get people to the event and make some money! I set up a fundraising page for you on MyCause and all you have to do is tell people about it. MyCause keep 5% of donations as an admin fee and as long as you get more than 15 people we don't take anything. Using the MyCause website also makes it very easy to share via Social Media to tell more people about your bootcamp fundraising event. Together we pick a date that suits. We generally recommend a Sunday morning, but am are open to other days/times. If your organisation has a suitable oval or gym/hall then I come to you. If not, I can source one for you. Give me a call on 0437 500 077 or send me a message via the contacts page and I'll be happy to send you more details about how it all works! Just go to the contacts page and fill out the form and I will be in contact with you ASAP to organise your event!